Seeds, plants, tools, soil amendments, row covers, supports…it all adds up! But if your pockets aren’t bottomless, or you simply don’t want to fork out fistfuls of cash, there are lots of ways to grow more for less. Read on or watch our video to find out how to plan a low-cost vegetable garden comfortable for any budget. To grow a garden you need seeds and plants, but the cost of them can quickly escalate. Local seed and plant swaps are a great way to bulk out a new garden on the cheap, or even for free. Choice will be limited, so you’ll need to be flexible – and as it’s a swap, you’ll of course have to have something to offer in return. If you have to buy seeds – which you probably will – look out for special offers on seed supplier websites both before the start and towards the end of the growing season. Remember, while most seeds keep for more than one season, some - including parsnip, corn and spinach - will need replacing every year or two. Open-pollinated, or non-hybrid varieties of vegetables open up the possibility of saving your own seeds. Tomatoes, beans and many leafy salads are very easy to save seeds from, which means you’ll only have to buy once. Nutrient-rich organic materials are the best way to build soil fertility and structure. You can make your own compost for free – and you don’t need a special container or compost bin to make it in. Set up a compost heap in a quiet, out-of-the-way corner sheltered from strong winds, and preferably with some sun to help warm the heap and speed up decomposition. Keep the heap tidy by hemming in the sides with recycled materials such as old pallets, which can usually be acquired for free. In the fall there’s no shortage of leaves, so gather them up to make your own leaf mold – a great soil amendment. If you can’t get enough leaves, ask friends and neighbors if you can have theirs. Most people will be only to pleased to get rid of them! Farms and stables will often give away manure, if you’re happy to collect. But check that the animals haven’t been feeding on plants treated with herbicides or you may unwittingly damage the plants you plan to grow in it. And make sure it's well rotted down or composted before using. Climbing crops like beans and cucumbers need sturdy supports. Bamboo canes aren’t that expensive to buy, but they’re free if you grow your own! 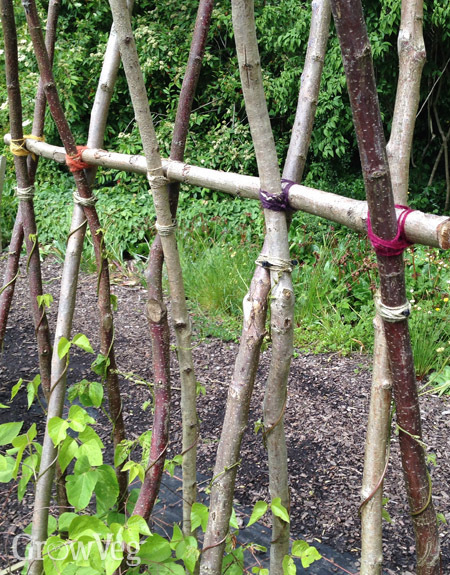 In fact, any strong, straight woody stems make excellent poles for climbers, including stems cut from the likes of hazel and buddleia. Many crops need protecting at some point, whether from the cold, sun or pests. For cold protection, make use of old clear bottles, polythene stretched over homemade hoops, or recycled glass doors and windows. Improvise shade cloth with old tulle or net curtains, laid double thick for extra protection. Newly sown beds of cool-season crops like lettuce can be shaded with cardboard until the seedlings poke through, or protect recent transplants with upturned pots for a couple of days until they settle in. You can also make collars against cold winds for earlier on in the season since the drying effect of the wind is often more damaging than low temperatures. Hoverflies and other insects can perform free pest control services for you! Don’t fork out on costly artificial pesticides which tend to kill good bugs as well as bad. Leverage the power of nature to help you defeat pests on the cheap! Include nectar-rich flowers in your plan to attract pest predators in their droves. Flowers such as coreopsis, cosmos, poached egg plant and alyssum will draw in hoverflies, lacewings, ladybugs and parasitic wasps to make short work of pests like aphids. Equally effective are flowering herbs such as dill, fennel, parsley and cilantro. Or leave some carrots and onions in the ground to run to flower the next season. Remember, just about anything that holds potting soil can be used as a container for plants. Whatever you use, make sure you puncture holes into the bottom for proper drainage. For seedlings, you can’t beat old yogurt pots, soft fruit trays and mushroom trays. Or make your own from toilet tissue tubes or newspaper. Toilet tissue tubes are especially suited to deeper-rooting seedlings such as corn or beans, encouraging a more extensive root system which will help plants to establish quicker once they’re planted. Paths can be as permanent or ephemeral as you choose. Make low-tech, cheap paths by simply covering the ground in bark chippings. You can add a double layer of cardboard beforehand to help smother any weeds beneath. You’ll need to top up the wood chips from time to time. Or opt for something more substantial, made from salvaged slabs, bricks or cobbles. You can make purchased hard landscaping go further by infilling with cheaper materials like gravel. A living boundary can also be a cheap one if you buy the plants bare-rooted in winter. You’ll need a little patience while it grows but a hedge is always going to look better than a fence! And don’t forget, you can also make it productive by planting trained fruit trees or fruiting hedgerow species like blackthorn. Don’t let anyone tell you you need lots of money to start a garden – as you can see it’s possible to create a beautiful, productive garden for next to nothing! "Using toilet paper holders when your planting do you leave the container "carboard" on??" "Yes, you can leave the cardboard on as it will rot down. However, in dry soil it is sometimes best to remove the cardboard, or at least peel off some of it, as cardboard can act as a wick, drawing away valuable moisture from the potting soil within it."